HELP!!! I'm in dire need of some help locating the name of a poster artist. 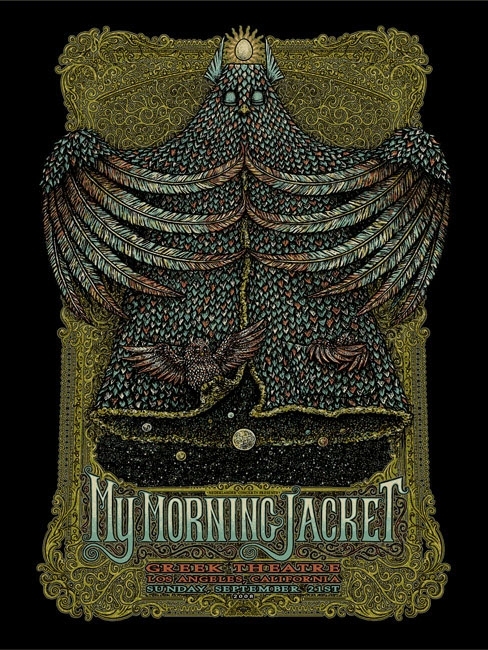 The poster in question is My Morning Jacket with Shabazz Palaces at The Greek Theatre Berkeley, California on 9/15/2012. It is not the Matt Leunig sloth poster but rather one that looks like the portrait of a man but instead of the man's head, it is red and brown "brain-like" splotches. I haven't been able to find a copy of it online and am trying to figure out how to post an image of it here. Any help in finding the artist of this poster would be greatly appreciated!!! I know the poster your talking about but I want to say it's a Monsters of Folk poster. Doesn't match your date or venue though. It could be your artist, he does a lot of what your describing.